Sir Paul McCartney admits songwriting with John Lennon was 'competitive' . Beatles Radio: The Beatles, Solos, Covers, Birthdays, News The Fab 4 and More! Sir Paul McCartney relished the "competitive" nature of his relationship with John Lennon. 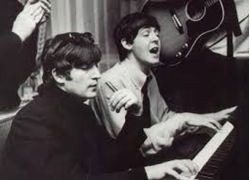 The iconic duo penned some of the most famous songs in history during their days with the Beatles, and Sir Paul has revealed how the late star's determination to be the best helped to improve his own songwriting. He explained: "It was quite competitive because if I wrote something he'd try and better it and then I'd try and better that, so it's a good system. "It means you're going up a staircase and each time you're trying to make it better, so if that works it can make the song very good ... and in our case memorable. "That was the trick because we couldn't put it down, we couldn't put it on a recording like today, you just had to remember it. So that was a good restriction too, it meant if you forgot it, too bad. "So, it had to have a hook and nearly always, even if you forgot it in the evening, you'd go out for a drink and say, 'what was that bloody song'. You'd wake up in the morning an go 'oh yeah, I remember!' It would just come back." The Beatles split in 1970, but Sir Paul never considered quitting music altogether, admitting it remains his obsession. He told Australia's ABC: "It was either that or quit. And that was the decision at the time but I realised I liked music too much and if I quit, I'd still be doing it as a hobby. "If you're a good cook, and they suddenly say 'Ok, you've won MasterChef', it's not like you're going to stop cooking. "It's something you love doing, same for me, it's something I love. "I'm always surprised when a song comes because I started with nothing and suddenly get a little idea I'm chasing and go 'ah, is this good?'. If you write something decent, you feel good. It's all part of the same thing. It can be a little bit of a therapy thing to."